The job of a heart surgeon requires skills and training; a cardiothoracic surgeon salary is one of the highest in the medical industry. This is because of the delicate nature of the profession, a lot of heart surgeries a done every year, this for all age groups. India is known has a medical tourism destination, they are responsible for over a thousand heart surgeries, most of their clients try to avoid the high cost of operation in the US, UK, Germany, and Canada. Their best clients have been the developing countries, who have little or no cardiothoracic surgeons or facility to carry out a heart surgery. There is a huge salary difference between a cardiothoracic surgeon in training and cardiothoracic surgeon fellow. This is due to the level of training, education, and qualification. Experience also play an important role in determining what the salary would be. According to data collected by PayScale, the range of a cardiothoracic surgeon salary is $100,143 – $609,837 per annum, while the median salary is put at $340,237. This figure puts them ahead of many other surgeons regarding pay difference. Looking into their hourly rate range of $23.84 – $347.31, it is indeed a career to focus on. Who is a Heart Surgeon or Cardiothoracic Surgeon? The cardiothoracic surgeon is responsible for performing heart surgeries and other complex operations on patients with heart conditions. The job requires a high level of skills, ability and training to do the task. Most are skilled with the use of their hands, they can stand long hours, they have sharp and observant eyes and are mentally and emotionally stable. They undergo series of practice and training before performing a live open heart surgery. 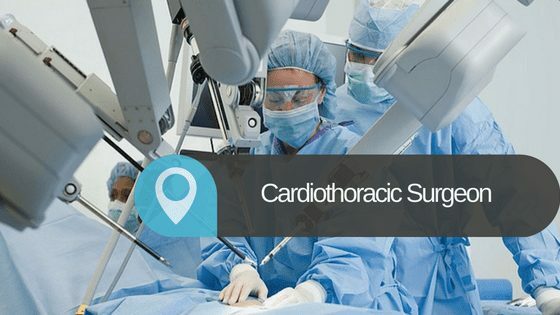 Today, there is a new technology that has made cardiothoracic surgery less invasive, but the skill is still needed when operating this technological machines and tools. There are a limited number of cardiothoracic surgeons in the world today, they live in different countries, so is the salary they receive. The heart surgeons salary in the United States is very high, so is that of Canada, UK, Australia, Germany and South Africa. Among the doctors in India the cardiothoracic surgeon salary there is probably the highest. A cardiothoracic surgeon salary range is between $100,143 – $609,837 per annum and $23.84 – $347.31 per hour. A median of $340,237 annually, this include allowances, bonuses, and other financial entitlements. There is a fear of cardiothoracic surgeon shortage soon; this is due to the number of candidates allowed into residency and cardiothoracic surgeon specialty. The profession is a specialty under cardiology and few people, eventually, make the cut to train as a cardiothoracic surgeon. They are usually the top 10% in the class or group. They receive benefits and perks such as paid vacation days, health insurance and life insurance, bonuses and profit-sharing and other as well. The job description of a cardiothoracic surgeon is both straightforward and complex, what is needed even more is the skills and ability. They are observant, organized and calm. They need steady hands and a clear head to work. An excellent interpersonal skill is required to collaborate with other specialists, especially the nurses, physicians, and other surgeons. Cardiothoracic surgeons follow strict protocols and observe appropriate deadlines. They do the following; coronary bypasses, valve repair and replacement, and installing assistance devices. The use of technological equipment to study and analyze the patient’s condition. The use of modern robotics to do surgeries where applicable. They advise the patient on possible routine and diet post surgery, they also examine and monitor them periodically. Before any surgery, they do tests to verify that surgeries were successful and gather with other specialists to discuss research, clinical data, surgery invasion and options, and patient’s medical histories. Treat complications of ischemic heart disease (such as, coronary artery bypass grafting), correct congenital heart disease, or treat valvular heart disease created by various causes including endocarditis. Provide surgical care of coronary artery disease, abnormalities of the great vessels and heart valves, congenital anomalies, tumors and diseases of the diaphragm. Treat pathologic conditions of the lung, esophagus and chest wall, abnormalities of the great vessels, tumors of the mediastinum, and diseases of the diaphragm and pericardium. Provide operative, preoperative and critical care diagnosis, treatment and procedures for patients with pathological conditions of the chest. Communicate with families and patients about care plans and make referrals to other specialists as per the standard of care. Only the very best and top 10% in the medical school, get into a residency program in cardiology. Among them a few make the cut to become a cardiothoracic surgeon. The training program is long and intensive; it begins with a four years bachelor’s degree in a science related course. You must sit and pass the Medical College Admission Test – MCAT, to gain admission into the Medical school for four to six years. After sitting and passing the finals in the med school. You apply for residency in an approved hospital, to specialize in cardiology for another four to six years. During your training exams will be conducted and another two years in cardiothoracic residency. Becoming a fellow is a plus in will guarantee a good salary has a heart surgeon.